Inter-district rugby resumed after a break of five years with the meeting of South of Scotland and Caledonia at Jed-Forest RFC’s Riverside ground in what many hope will be the precursor of regular such matches. The expectation is that the two districts will play in a return match next season. Meanwhile South have had talks with officials from Edinburgh clubs in an attempt to draw in the capital to a revived district championship. South are also believed to have engaged with several districts in the North of England for similar fixtures. As to events on the field at Riverside, South used their experience both to contain a Caledonian side which played the more entertaining rugby, combining precision passing and continuity in attack that tested South’s defence to near breaking point. “Our defensive performance was very good. Caley had a lot of ball and a lot of territory but we were more desperate in defence.” said South’s forwards coach Kevin Barrie. Reds coach Colin Sangster suggested that South were a bit more streetwise. Caledonia Reds were smartly out of the blocks retaining possession to create a try for prop Alan Brown, Liam Brims adding the conversion. But South replied quickly to score through centre Lee Armstrong, skipper Gregor Hunter supplying the extra points. 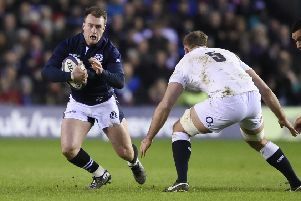 Then when wing Graham Spiers came off his blindside wing to create an overlap, full-back Lewis Young used his sevens pace to sprint through the Caledonia defence for an unconverted try. The Reds were again hit, this time by the sin-binning of back row Jake Eaglesham. South immediately took advantage of the extra man, winning the resultant penalty line-out and then launching an attack that resulted in a try for Hawick skipper Bruce McNeil and the conversion points by Hunter for 19-7 interval lead. South quickly added another score immediately after the break, this time centre Gregor Young emulating his twin brother with a try converted by Hunter after the Reds had lost possession in midfield. Having conceded tries either side of half time, the Reds tried desperately to claim back lost territory with some scintillating back play in which Peter Jerecevich, having moved out to stand-off, was the orchestrator-in-chief. But against a well-organised South defence their sought-after second score remained elusive. South: L Young (Jed-Forest); G Spiers (Gala), G Young (Jed-Forest), L Armstrong (Hawick), D Clapperton (Selkirk); G Hunter (Gala), S Goodfellow (Jed-Forest); S Muir (Hawick), M Carryer (Gala), C Keen (Gala), G Law (Jed-Forest), A Renwick (Selkirk), R Louw (Gala), S Graham (Hawick), B McNeil (Hawick) Replacements C MacKintosh (Hawick), C Hogg (Jed-Forest), C Reynolds (Gala), I Wallace (Kelso), C Weir (Gala), A Tait (Kelso), R Nixon (Selkirk), C Robertson (Gala). Caledonia : G Clow (Currie); A Rennie (Falkirk), E Oag (Glasgow Hawks), DJ Innes (Watsonians), J Webster (Heriot’s); L Brims (Falkirk), P Jerecevich (GHA); J Cox (Currie), D Russell (Dundee HSFP), A Brown (Dundee HSFP), C MacFarlane (Aberdeenshire) J Pow (Kirkcaldy), G Ryan (Aberdeenshire), C Jollands (Aberdeen Grammar), J Eaglesham (Falkirk). Subs L Skinner (Falkirk), A Cook ( Aberdeenshire), N Fraser (Aberdeenshire), T Turpie (Howe of Fife), G Arnott (Dundee HSFP), S Lathangie (Howe of Fife), S Knudson (Aberdeen Grammar), J Adamson (Falkirk). Scorers: South – Tries: Armstrong, L Young, McNeil, G Young, Nixon. Cons: Hunter (4). Caledonia Reds – Try: Brown. Con: Brims.